Irwindale Speedway, commonly referred to as the House of Drift amongst Formula Drift fans holds a dear place in the heart of the drift community as it was home to the first organized, large-scale drifting competition on United States soil back in 2003. 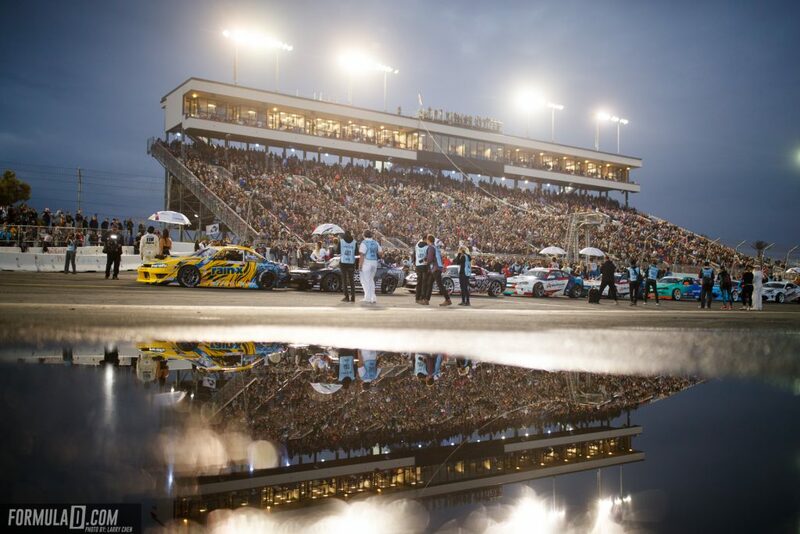 Ever since, Irwindale has played host to the eighth and final round of the Formula Drift season, otherwise known as “The Title Fight”. The 2017 season finale was slated to be the last time Formula Drift would close out its season at Irwindale due to the pending demolition of the speedway at the end of the year. Despite FD fans leaving the event in 2017 thinking it would be the last, a deal in the off-season ensured the speedway was there to stay and in turn, so was Formula Drift. With the stage set for an epic return of Formula Drift to Irwindale in 2018, fans eagerly filled the stands to cheer on their favorite drivers and ultimately see how the championship race would pan out. Well before the first tires were turned to smoke, the competition was at an all time high. The 2017 Formula Drift Champion, James Deane, was in a tightly contested battle with 2015 champion, Fredric Aasbo. Leading by a slim margin, Deane was eager to defend his title and be crowned the back-to-back champion. With Deane and Aasbo at the top of the season leaderboard and the way the bracket was setup, many assumed the two would ultimately battle it out door-to-door in the semi-finals as they chased down the trophy. With strong qualifying runs from each driver and a record setting score of 99 for Deane, both drivers received a bye in the round of top 32 and moved on to the top 16 with ease and the chase for the title was on. Little did Deane know, Forrest Wang behind the wheel of his 2JZ-powered S15 had other plans. After being knocked out by Deane in the Top 16 of Round 2 in Orlando earlier this year, Wang was out for revenge. If you didn’t think Wang was eager to knock Deane out before their battle, it was apparent after watching him strategically place his car on Deane’s door throughout his chase run and pull away on his lead run while showcasing the signature Forrest Wang flick into each corner. Ultimately the judges advanced Forrest to the Top 8, leaving Aasbo a clear path to the title. Deane out of the competition, Aasbo would have to pilot his infamous yellow Toyota Corolla Hatchback to the top of the podium. Anything less than first place would result in Deane maintaining his place atop the season leaderboard. With a championship on the line, the narrative for the reminder of the night was largely framed around Aasbo. 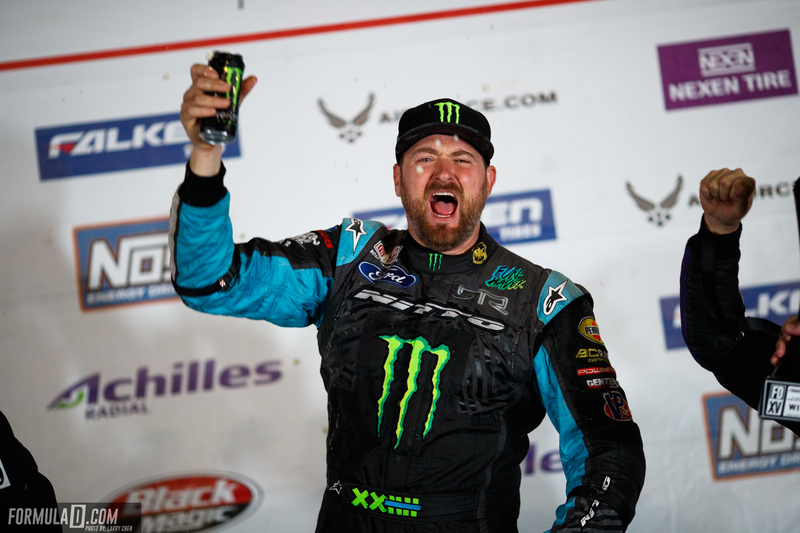 Fans anxiously watched as he slowly worked his way through each round, ultimately landing himself in the final battle of the night against none other than FD-veteran, Vaughn Gittin Jr. And what a battle it was! After a lead and follow run by each driver the judges could not decisively crown a winner and elected for a one-more-time. The following battle was as tightly contested as the last, earning another one-more-time from the judge. As the old saying goes, third time’s a charm and ultimately a slip up by Aasbo sent the rear of his car every so slightly into the wall, just enough to decisively give Gittin Jr. the victory and securing Deane’s place as the 2018 Formula Drift Champion. With the highly anticipated return of Formula Drift to Irwindale, the expectations for the final round of the season were high and fans were certainly given the show they came to see. Our MagnaFlow team thoroughly enjoyed our time at Irwindale throughout the weekend, from meeting fans to catching the amazing driving, a good time was had by all and we cannot wait to see Formula Drift fans and customers again next year!